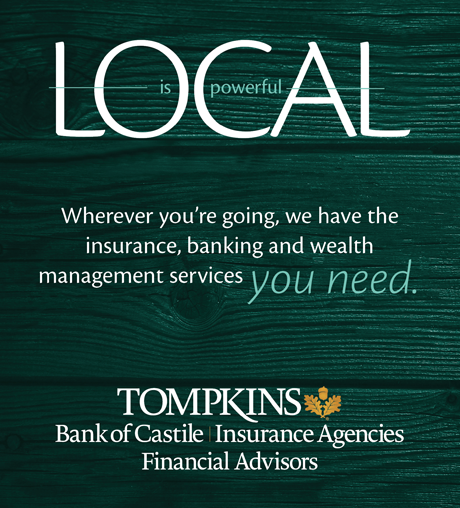 posted by Howard B. Owens in Tompkins Bank of Castile, business. As more fully disclosed in the Non-GAAP disclosure tables included in this press release, it is helpful to view comparisons to prior periods on an adjusted basis to exclude the impact of certain significant non-recurring items. Most notably, earnings per share and net income in the fourth quarter and year-to-date periods of 2017 were impacted by a one-time non-cash write-down of net deferred tax assets in the amount of $14.9 million as a result of the Tax Cuts and Jobs Act of 2017. On an adjusted basis, year-to-date diluted earnings per share for 2018 would have been $5.33, an increase of 20.6% over the adjusted diluted earnings per share of $4.42 reported for the year ending December 31, 2017. For the fourth quarter of 2018, adjusted diluted earnings per share of $1.23 reflecting an increase of 7.0% over the $1.15 adjusted diluted earnings per share reported in the same quarter last year. Refer to Non-GAAP Disclosure tables for additional details. Due to changes in the Federal tax rates between periods, it is also helpful to view the current period and prior period earnings performance on a pre-tax basis. Income before tax expense was $104.2 million for the year ended December 31, 2018, and $23.8 million in the fourth quarter of 2018, reflecting an increase of 9.4% and 13.5%, respectively, over the same periods in 2017. President and CEO, Stephen S. Romaine said “We are pleased to once again report record earnings for both the full year and quarterly periods. The results are especially rewarding in today’s environment of uncertain economic conditions. During the quarter, our net interest margin remained relatively stable as growth in average noninterest-bearing deposits helped soften the impact of rising market interest rates. Our diversified revenue sources have served us well in volatile markets, as fees from insurance, wealth management, and banking related services provide a revenue mix that is less dependent on interest rates. During 2018, each of these fee-based business lines reflected growth over the prior year." Total loans of $4.8 billion at December 31, 2018, were up 3.5% over December 31, 2017, while total deposits of $4.9 billion were up 1.1% from the prior year-end. Growth in net interest income for the year ended December 31, 2018, was largely driven by $356.4 million of growth in average loans during the year, an increase of 8.1% over the prior period. Average deposits for the year ended December 31, 2018, increased $89.7 million, or 1.9% compared to the same period in 2017. Included in the growth of average deposits during 2018 was a $103.5 million increase in average noninterest-bearing deposits, up 8.1% from the prior year average. Noninterest income represented 26.8% of total revenues in 2018, compared to 25.6% in 2017. For the full year, noninterest income of $77.4 million was up $8.2 million, or 11.9%, when compared to 2017. Noninterest income was $19.9 million for the fourth quarter of 2018 and was up $2.5 million or 14.7% compared to the same period in 2017. Fee income business related to investment services, service charges on deposit accounts, and card services income all contributed to the increase over the fourth quarter of 2017. Declines in the stock market during the fourth quarter of 2018 resulted in lower investment services fees tied to assets under management, though the impact was offset by higher than normal fees associated with trust and estate activities.